It’s time to check out a car game that I recently got. This may come as a surprise to some, but I’m actually a huge fan of the racing genre. There are few things more satisfying than nailing a crisp turn and sailing into first place. It’s why I used to play a car game on my PC for so long. Anyway, this is the first racing game that I’ve played in a while, not counting spinoff titles like Farmyard racing. This is probably the first pure racing game I’ve played since Asphalt 3D. (I think that was the title) This is definitely a really fun game and one of the best core driving games out there. It does have a gimmick and while I sometimes prefer my racing games not to have any (F-Zero) I don’t mind them if they’re handled well. Look at Mario Kart after all. There are a few modes to play when you start the game. Online mode is around of course, but you’ll likely be heading straight to Season mode. (Honestly, I haven’t gone online at all) The season has 12 episodes in it and the general plot is that you’re starring in the show. Think of it as one of those reality programs on TV. You have to dodge all of the landmines and disasters to claim first and prove that you’re the best. Each episode has 5 events, with the final one being unlocked if you’ve earned enough points. Rinse and repeat until you’ve reached the end and you can replay old levels to increase your standing and earn more points if you’re short. For the most part I was able to make it to the end naturally but I did need to replay a few. Once you unlock a certain car at the end of the game, you’ll be breezing through it with no problem. There are different kinds of events. The main one is a race. You go through the stage and try to come in first. The gimmick that this game rolls with is that you can use your energy meter to set off traps. You can energy by turning and driving behind another car. The best way is to dodge an opponent’s trap, but they rarely spring any. You can activate traps as soon as one energy bar is filled or you can wait til they’re all filled and activate a massive one. I don’t recommend the latter since you’ll typically destroy yourself as well. If there’s going to be a gimmick, I typically prefer a quick booster, but I can live with this. It’s a pretty unique concept after all and I like the strategy behind it. You always have to decide if it’s worth using your energy now or later. Another event is Elimination. You start with 60 seconds and have to ensure that you’re not in last. After that, another car is eliminated every 20 seconds. You must stay at the head of the pack or you’ll risk being eliminated. This is another pretty fun event and as it’s quite a bit shorter than a race, it’s a lot easier to keep on replaying. Another event is the Airplane boss. You have to attack it by shooting missiles using your action meter. In this case, I recommend waiting until the red one is ready to go since you can then deal massive damage. Next is Survival which is probably the weakest by default. It’s just you by yourself as you try to complete the stage while the A.I. activates all of the traps. It’s essentially a time trial so it’s not all that exciting. Finally, there’s the Oil tanker battles. This is the best one by far. A truck ahead of you will be spilling barrels and you have to dodge them as you overtake it. The more trucks that you pass in a row without being hit, the more points that you get. It really tests your reaction times and takes you down if you dare to go too fast. It’s just a lot of fun and I would have loved to have seen more of it. The variety of events in the game helps keep the gameplay fresh throughout. With 72 levels in the game, it’s certainly one that has an ample amount of content. If anything, I’m glad the game didn’t overdo it and throw in over 150 levels just because it can. As it is, most of the levels are the same. I think there may be 12 tracks total, with a few more if you count night versions. It’s not a lot although I suppose it’s a decent amount. You’ll memorize the layouts after a while which is certainly useful. There’s a lot of replay value here as well. If you decide to aim for the Platinum, you’ll need to get 1st place on every level which will be quite difficult. It’s certainly not impossible, but I’d expect you to be replaying the levels many times before you can finally ace them all. Multiplayer also guarantees that the replay value is basically unlimited. The graphics for the game are quite good. All of the cars look shiny and new. I could have sworn that one of the cars almost looked as good as the Ford Focus. The levels are nice and bright and the rare night time versions are also quite crisp. The game has aged very well there. Furthermore, the soundtrack is also pretty nice. There are some really good action themes. The music fit in pretty well even if I didn’t notice it in some episodes. It would sort of pop in and pop out if that makes any sense. I suppose not every theme can be an instant winner. The game’s difficulty level feels pretty fair. There was a very brief time where I felt the computers were a little too fast and strong, but once I got the super car it was all good. I never really mastered the drifting mechanic, but I’d say that it felt fair. The overall gameplay was nice and smooth. Towards the end there weren’t many opportunities to drive as fast as the title would suggest, but driving as fast as possible was always very satisfying. I also have to give a shoutout to the ending of the game. The voice acting was spot on and the way the game ends just begs for a sequel. Whether we get one or not, it works really well as a stinger. I was practically shaking by the end of the cutscene. You’ll see what I mean when you watch it, but I can safely say that I would be super hyped if they announce a sequel. 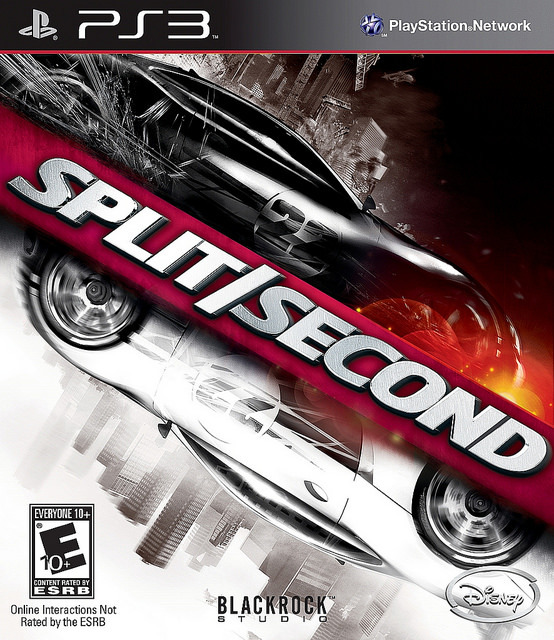 Overall, Split Second is definitely a great game. It’s one of those titles that you just don’t want to put down once you start it. You’ll find yourself wanting to play it constantly and you’ll be sad once it’s over. Once again, I do think the length was just right though. Extending it further might have felt artificial and they also got the right balance with the points needed to unlock the final levels. You had to do pretty well in the events (1-3rd place for the most part) but it wasn’t anything too crazy. You don’t want it to have to be a grind to beat the game, that should be left for the people who want the Platinum. The game was just solid on all accounts and I’d highly advise buying this title. It’s one of the best car games on the market.